The Offline Favorites for WP-AppKit addon allows to manage offline favorites in your WP-AppKit app: set some posts as favorite to read them later, even if all app content has been refreshed in the meantime. This addon is compatible out of the box with the Q for Android default theme (as of version 1.2.0 of the theme). If you need to use it in an other theme, see the following section “Use the Offline Favorites addon feature in your own theme”. Install this addon using the downloaded zip file as you would install any WordPress Plugin (Plugins > Add new > Upload plugin). Then in your WP-AppKit app edit panel, check the “Offline Favorites for WP-AppKit” addon checkbox in the “Addons” panel (at the bottom of the screen), then save the app. 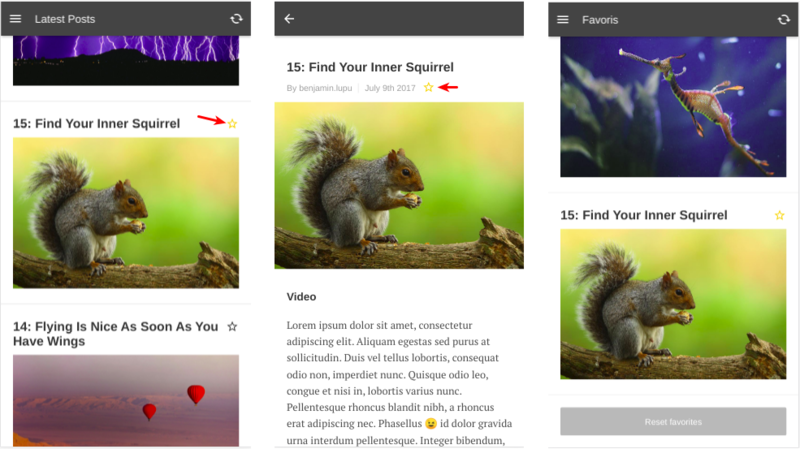 Once the addon is activated for your app, a new component type is available: the Offline Favorites component type that allows to display a list of all posts marked as Favorites in your app. Add a Favorites component to the app. Then add this component to your app menu and save the app. “un-favorite” a post from its single screen, a post list screen or from the favorites list. Posts that are marked as favorites will stay in the app as long as you don’t un-favorite them, even when app content is refreshed. Once activated for an app, the Favorites addon handles all the “Add/Remove/List” favorites features automatically, provided that the theme defines the corresponding template and uses the right CSS classes on the elements that handle the Favorites feature. and replace TemplateTags.getPostLink(post.id) by TemplateTags.getPostLink(post.id, post.global) because we are in a custom template where post global is not automatically set. 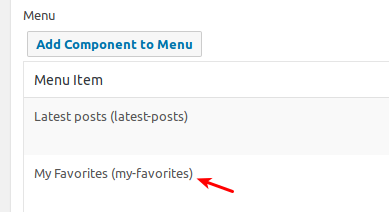 the element that toggles the favorite state of each post (a star icon for example) must have the favorite-toggle class. this “toggle favorite” element must also have the WP-AppKit post “data” attributes that are retrieved automatically by the function TemplateTags.getPostDataAttributes( post.id ). if you implement a “Reset favorite” button in the archive-favorites.html template, it should have the class favorite-reset to be recognized by the addon. For an implementation example of this custom archive-favorites.html template and CSS classes, see the Q For Android theme.